California falls entirely within the subtropical climate zone, which is the transitional zone between the hot tropical climate zone to the south and the temperate climate zone to the north, which is known for its four completely different seasons. The reason for this is the geographic location of the state, which stretches roughly between 32° and 42° north latitude. Average for the planet, the subtropical climate zone usually covers the territories between 30° and 40° north and south latitude, so this largely explains why California is located within this climate zone. Although the state covers also some territories to the north of the 40th parallel, the borders of the climate zones often vary from one place to another, and in this case the subtropical climate zone continues to the north, on the territory of the neighboring state of Oregon. Because of its location, California is considered one of the places with the most pleasant and healthy climate not only in the United States but in the world. In general, the climate of the state is subtropical Mediterranean, which can be found along the coast of Southern Europe (Spain, Portugal, France, Italy, Greece, Cyprus, Turkey and others), large parts of Chile (especially in the area of the capital Santiago) as well as parts of South Africa and Australia (particularly in the state of South Australia). The subtropical Mediterranean climate is characterized by long, warm summers and short mild winters. However, it should be noted that beyond the cliché of the eternally sunny and warm weather of California stands a state with extremely diverse climate conditions. While much of California really enjoys a typical Mediterranean climate, other parts of the state, due to the relief and the strong influence of the ocean, are quite different. On one side, there are high mountain areas which are covered by deep snow cover every year for a long time during the winter months. There are also areas that sometimes experience very low temperatures. On January 20, 1937, in Boca, Northern California, is recorded the lowest temperature in the state ever of (-43)°C or (-45)°F! On the other side, there are desert areas, such as Death Valley, which is considered the driest and hottest place on the planet. On July 10, 1913, in Death Valley is recorded the incredible temperature of 56,7°C or 134°F! 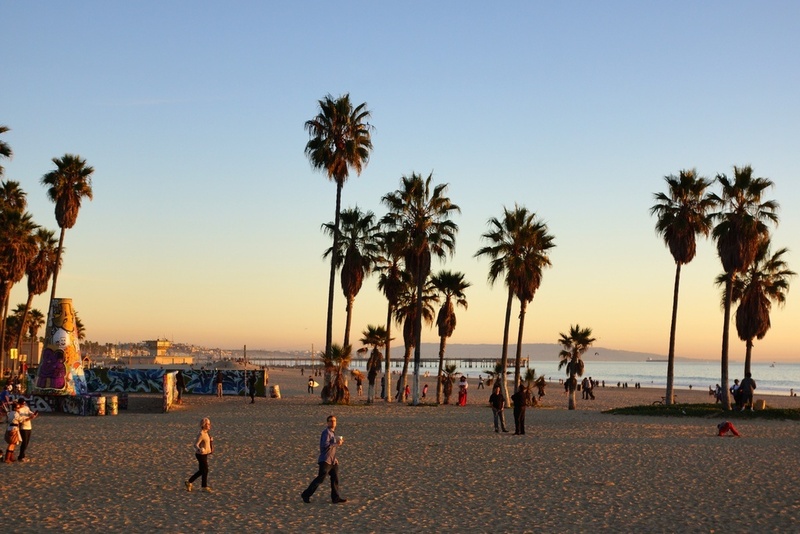 Although within the same climate zone, the differences between Northern and Southern California are sometimes dramatic. Northern summers are shorter and are usually pleasantly warm, but not hot. In San Francisco for example, although located in the hearth of the subtropical climate zone, the weather is usually quite cool, with fresh temperatures even in summer. Winters are usually wet and mild but sometimes are also relatively cold. The climate in Northern California is more humid than the climate of Southern California and has many characteristics of the temperate climate zone. On the other side, southern summers are long, hot and dry. Compared to the northern parts of the state, the average daytime temperatures are much higher. Winters are short and mild, and sometimes the daytime temperature reaches summer values. The South of California often experiences the influence of hot and dry tropical air masses, which sometimes for a while bring temperatures of between 25 and 30°C even in winter! Actually, these air masses have created over the years the image of Southern California as a place where summer never ends. What is the influence of the Pacific Ocean on the climate of California? Pacific has a very strong influence on the climate of California. In this part of the ocean runs the cold California current. The water temperature here is relatively low throughout the year, ranging in different parts of the state from 10-15°C in winter to 18-24°C during the late summer season. Usually, along the northern coast of California the ocean water temperature is several degrees lower than along the southern coast of the state. The cold California current is the reason for the lesser amount of water vapor, resulting in a predominately dry and sunny weather. Therefore the weather in California is considerably drier than in other coastal states like Florida on the east coast of the United States, where the warm Gulf Stream has a huge impact. However, the same cold current is the reason for the relatively low summer temperatures in Northern California and is the main reason for the frequent fogs that often occur in most coastal areas to the north. San Francisco is a good example of a city in Northern California. It is located in the heart of the subtropical climate zone but experiences a relatively cool climate because of the influence of the cold ocean current. The number of foggy days here is actually bigger than in other cities that are considered to be foggy and cool, such as the British capital London. What is the influence of the mountain chains on the climate of California? Unlike states such as Florida, where the relief is flat and for this reason it doesn’t play the role of a barrier on the road of air masses, California is very different. It is a state that for the most part is occupied by high mountain ranges. These mountains are the best example of what is a climate barrier because they stop the moist ocean air coming from the Pacific and for this reason it doesn’t reach the states in the interior of the country. Moreover, the humid ocean air doesn’t even reach the interior of California itself, causing the formation of desert areas on the territory of the state. For this reason in the interior of California are located some of the hottest and driest spots on the planet. On the other side, the mountain slopes on the way of the moist air masses are covered by lush rainforests. These forests are typical for Northern California and cover big part of its territory, especially the coastal areas. What is the role of urban pollution on the climate? Urban pollution definitely has its effect on the climate. Although the difference is not so dramatic in degrees Celsius or Fahrenheit, it still exists. The most significant is the influence of the urban pollution on the climate in cities like Los Angeles, where millions of people live and are concentrated many of the industrial capacities of the United States. Traffic and industrial pollution in cities like Los Angeles create the so-called “heat island” where the reason for the warmer weather is the human activity. The most specific side of this factor is that people can feel the heat island influence as long as they are on the territory of the city.